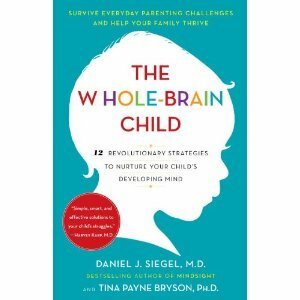 I love that my child always has a behavior causing me to try one of the strategies from The Whole-Brain Child. It was a calm weekday morning. My husband was making breakfast, the girls were downstairs, I was by myself for a few minutes, and then the screaming started. Elise spilled juice on her flowered dress and proceeded to spew her feelings all over everyone. “Fine I didn’t want juice. Fine I just won’t have anything. Fine my dress is ruined. No I don’t want another dress. I can’t wear this dress it is wet. You don’t want to help me.” She has even started a new dig where she tells her dad she doesn’t love him anymore and that she won’t miss him if he dies. I don’t know why she feels the spilt juice so deeply, but she does. And what she’s screaming is typically the opposite of what she means, but I do not recommend trying to reason with her at this time. So, what do Siegel and Bryson have to say? In Elise’s case, she was extremely disappointed that she didn’t get to wear her flowered dress. I said, “You sound really sad and angry that juice spilled on your dress. Sometimes when I get dressed and then Maggie spits up on me or poops on me or I spill coffee, I get really frustrated because I have to pick something out to wear again.” And you know how Elise responded? She simply replied, “Yeah, I really wanted to wear my dress,” sans screaming – amazing. I asked her if she wanted help picking out a new dress, and we were able to find one with a satisfactory amount of flowers. Now, I know this was not a “big” problem, but it was to Elise. And this was a first for it to be resolved so amicably. We have also used the name it to tame it with bad dreams, scary monsters and when we stayed three nights away from her. We have to retell the stories with her as often as she asks because she is the one still trying to make sense of what happened. Now I wish I could say that Elise and I resolve all our issues as amicably as the split juice, but we are still new to this. And, I need just as much practice as she does. One of my favorites is the sandwich that won’t stay put together and is “ruined,” so obviously throwing the whole plate of food on the floor solves the sandwich issue. Then there is yesterday’s debacle of asking her to clean her room; we are still recovering from that. Like I said we need practice, and luckily, we have a lifetime to perfect our strategies.